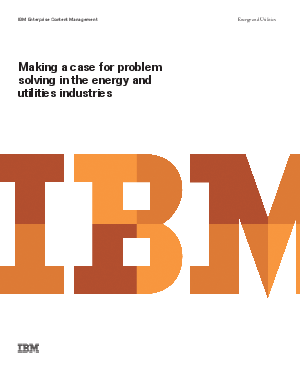 In today’s ever-changing business environment, energy and utility companies are under increased pressure to streamline their processes, reduce costs and improve customer service with fewer resources. To satisfy these demands while remaining competitive, companies need a better way to manage multiple tools and business processes — as well as the thousands of documents, drawings, and related content created from e-mail and social networking. Unfortunately, most energy and utility companies are handicapped with multiple, isolated, business processes that utilize a combination of time-consuming manual processes as well as automated systems to manage and solve a variety of issues. Typically there are disparate systems for creating and managing contracts, customer service, collaborative engineering, permit applications, documentation, materials management, maintenance and asset management --all of which need to be integrated to be more efficient.